The foundation for Hohensalzburg Fortress was laid in 1077. The castle and the surrounding realms have been at the center of European history, politics and culture for centuries. 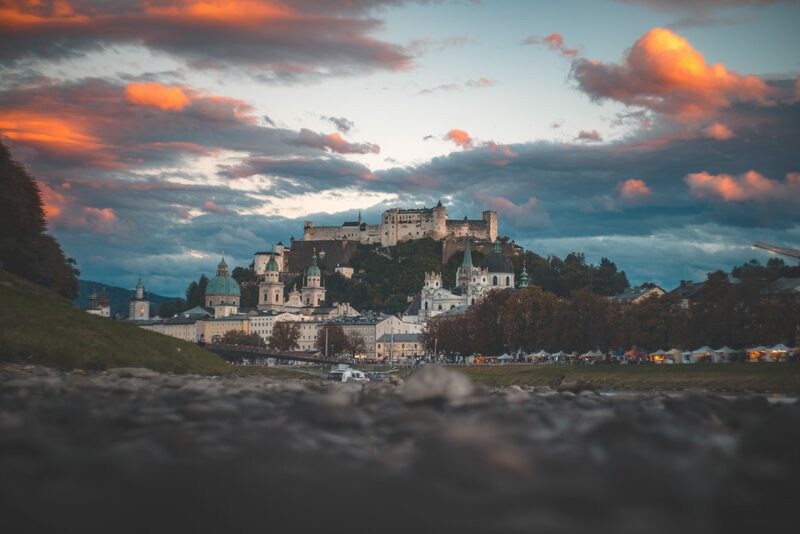 Salzburg is the scenic backdrop for the annual Salzburg Festival and, beloved by Americans, the movie The Sound of Music. 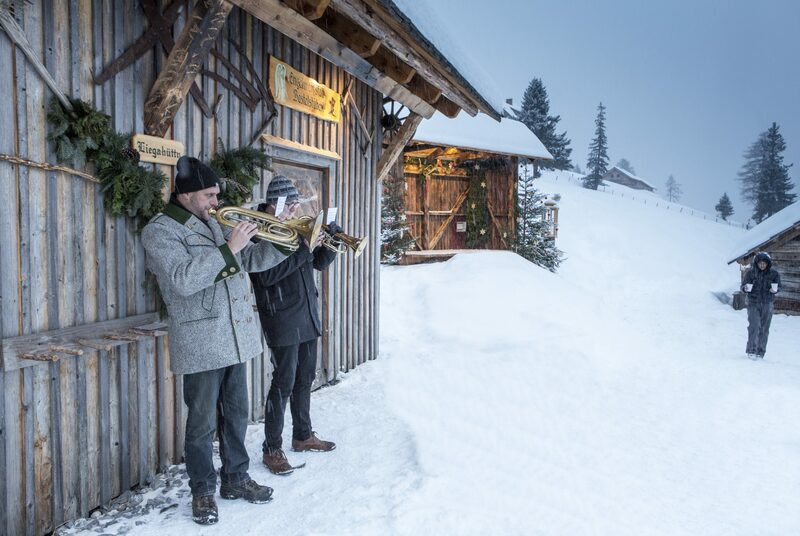 Between ravines of trees, the pitched slopes high above the village of Sankt Anton am Arlberg, 1,304 meters at the base, were already thick with white: caption, “winter season opened Oct. 30th,” with a contact telephone. In Salzburg, the Mirabell Palace gardens, at 420 meters, were still a lush green, but on snowy Kitzsteinhorn (3,250 meters) the chairlifts were already running. On the Großglockner (3,798 meters), enveloped in a cloud, there was nothing to see at all. But the number was on the screen; you could call and find out. In Vienna, the first of the Christmas markets have opened to the shimmer of lights and pungent aroma of Glühwein, as crowds stand around the wooden kiosks, oblivious to the cold. Markets seem to be around every corner: on the Freyung and Am Hof, on Maria Theresien Platz, Spittelberg and Resselpark by the Karlskirche. There’s a Christmas village of winding lanes at the Altes AKH, with real sheep and a donkey stabled by the Punschstand, and the sprawling Christkindlmarkt in front of the Rathaus, with countless Punsch stands in between. Geography shapes people, the contours of the landscape, the climate, the foliage, the layout of towns, the farmland and forests. Austrians love being outside, and most – even the Viennese – prefer a holiday in the countryside under the vast blue of the Alpine sky, on rivers or lakes, on a farm or in the vineyards, green and leafy, or crisp, white and very steep. They are proud of their mountain climbers – Heinrich Harrer, Reinhold Messner, Gerlinde Kaltenbrunner – and their skiers – Franz Klammer, Annemarie Möser-Pröll, Hermann Maier, Marcel Hirscher and so many more. They admire the risks associated with sport and most winters bring news of victories in international competitions along with chilling reports of avalanches and adventurers lost in the snow. Nobody sees this as grounds for a lawsuit or prohibitive regulation. Instead, they reach for a Red Bull, helping founder Dietrich Mateschitz turn the energy drink into a multibillion-euro enterprise – which, in turn, launched Formula One Red Bull Racing, Red Bull football clubs in Salzburg and New York and ice hockey in Munich, and a magazine dedicated to extreme sports. And they watch the German-Austrian TV series Die Bergretter (Mountain Rescue Squad), a perennial favorite on public television. The auditorium of the old Burgtheater was painted by Gustav Klimt in such detail that individual faces could be recognized. 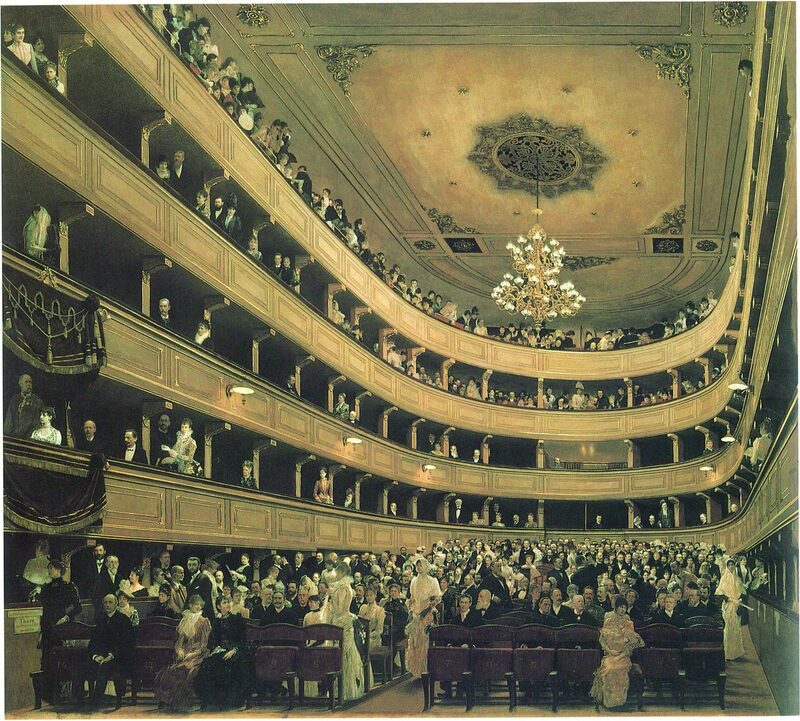 It closed its doors on October 12, 1884; just two days later, the new Burgtheater on the Ring opened. Vienna is another story. Here, winters are resolutely gray: From November to March, sunny days are few and far between. All the lights, music and celebration of the holiday season are a form of transcendence, a much-needed antidote to the weight of the melancholy that lies all too close to the surface. It is said that an Austrian lives in a two-room apartment, one bright, gemütlich and welcoming, the other dark, inscrutable and hidden from the world. It is this duality, this profound ambivalence toward life’s possibilities, that more than anything characterizes the Austrian, and particularly the Viennese, character. The Habsburgs understood this and were lavish patrons of music and the theater. “There must be spectacles,” declared the Empress Maria Theresa as she signed a decree to build the Hofburgtheater, which opened on Michaelerplatz in 1741 just outside the palace door. Under her son, Joseph II, it became the leading theater in the German-speaking world, a position Vienna’s Burgtheater holds to this day. But the roots go even further back, at least to the flowering of the Baroque that followed the rousting of the Turks in 1683. “Amid the euphoria of the Turkish retreat,” wrote historian William M. Johnston, “ravaged churches, monasteries and castles could now be rebuilt” in an explosion of statuary and marble, paintings, frescoes and gold leaf. The exuberance of these times is reflected to this day in countless golden-yellow palaces, colonnaded courtyards and onion domes across the former Empire, the signature and pride of the Habsburg lands – and mimicked with theatrical flare at the Würstelprater amusement park and by McArthur/Glen for their designer outlet mall in Parndorf. In this worldview, religion and worldliness were conjoined, and Baroque churches were an earthy paradise where all classes could share the luxury of kings. For centuries, the Habsburgs have been patrons of the arts. 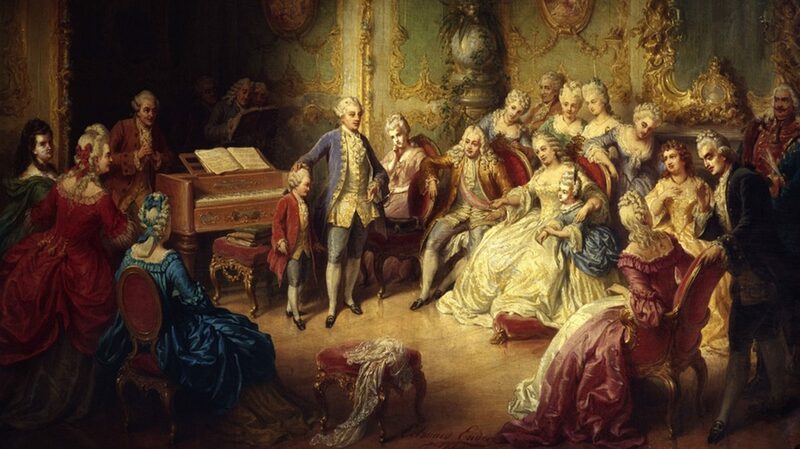 On October 13, 1762, Empress Maria Theresa and her family listened to 6-year-old Wunderkind Wolfgang Amadeus Mozart charming them by playing the piano and violin. The Jesuitenkirche on Universitätsplatz in Vienna is one of these, a place of awe and wonder, where, in late November, Bruckner’s glistening Mass in D soared over listeners’ heads, even richer and yet more delicate in the acoustic purity of the space. As redecorated by Andrea Posso in 1703, the nave of towering arches rises above and beside the central aisle, painted and paneled in green, gold and creamy rose; marble columns with golden crowns, and high above a trompe l’oeil cupola, so perfect that it takes 10 paces to give it away. Golden galleries and balconies, organ pipes shimmering like icicles high over the loft – it is almost too much to take in. It is in places like this that the devotion to theater begins. The turn of the 19th century began a golden age of theater in Vienna, with Joseph Schreyvogel joining the Hofburgtheater as dramaturge and director, and Emanuel Schikaneder opening his Theater an der Wien, still one of Vienna’s leading houses. This was the era of Prince Klemens von Metternich, foreign minister and chancellor under Emperors Francis I and Ferdinand I from 1809 to 1848, who governed with a heavy hand, censoring dissent, and operating a vast network of spies who duly reported back any nascent nationalist impulses that might threaten the status quo. Schreyvogel proved particularly adept at balancing commercial priorities while outwittng the censors, and in 1817 even got himself appointed as one. He also discovered the great Franz Grillparzer, Austria’s greatest dramatic poet, whose Der Traum, ein Leben is held the equal of Goethe’s Faust. To many, Grillparzer best captured the mood of the Metternich era, a deeply held pessimism and bitterness transformed in exquisite language. Impresario Schikaneder was a different sort: An actor and born promoter, he was a kind of P.T. Barnum of the stage. Talented, tireless, and irritatingly self-assured, he was also blessed with a level-headed theater wife, Eleanor, who had the generosity to give him a second chance – a story now restaged in 2017-18 as the musical Schikaneder, directed by Trevor Nunn, with music and lyrics by Stephen Schwartz (Pippin, Wicked, lyricist for Bernstein’s Mass) at Vienna’s Raimund Theater. Schikaneder was Mozart’s librettist for The Magic Flute, which premiered at his Theater an der Wien in 1791 with himself as Papageno, followed a decade later by Beethoven’s Fidelio in 1801, written while the composer was living in an apartment upstairs. Mozart’s delight in allegory paved the way for the enduring comedies of actor-playwrights Ferdinand Raimund and later Johann Nepomuk Nestroy. Raimund was the gentler of the two, capturing what theater historian Phyllis Hartnoll described as “a unique combination of wistful irony and delicately sentimental pathos.” His Der Alpenkönig und der Menschenfeind, a morality tale of magic and transformation, remains a staple of Austrian theater today. Nestroy, a generation younger, was harsher than Raimund and perhaps not as reflective. In the music halls, entertainers were transforming the old Ländler country waltzes into the enduring song form of the Wienerlied, dark and gentle satires of the shabby suffering of working class life. Wienerlieder paid homage to the abortionist (die Engelmacherin, the Angel Maker), the washerwomen who worked day in, day out, and sold themselves at night to make ends meet (die Spittelberg Huren, e Whores of Spittelberg). Like the novels of Charles Dickens, there were tales of orphan boys and street urchins who couldn’t earn a crust of bread. Under the relentless watch of the Metternich spies, the ironic tone of the Wienerlieder made it possible to talk about things that would otherwise be punishable. All the more appealing as guilty pleasures, the Wienerlied raised the tongue-in-cheek narrative to a high art. And if you think this is lost to history, think again. One recent evening at the Stadtheuriger Gigerl on Rauhensteingasse, as we ordered our first half-liter of Schankwein, a mellow older gentleman in a wrinkled white shirt and brown waistcoat, wispy gray hair rebelling against propriety, wandered in, leaned against the doorframe and began to sing. This was Ingomar Kmentt, a retired journalist turned Heuriger musician, who sings Wienerlieder for tips, to the strumming of a guitar. 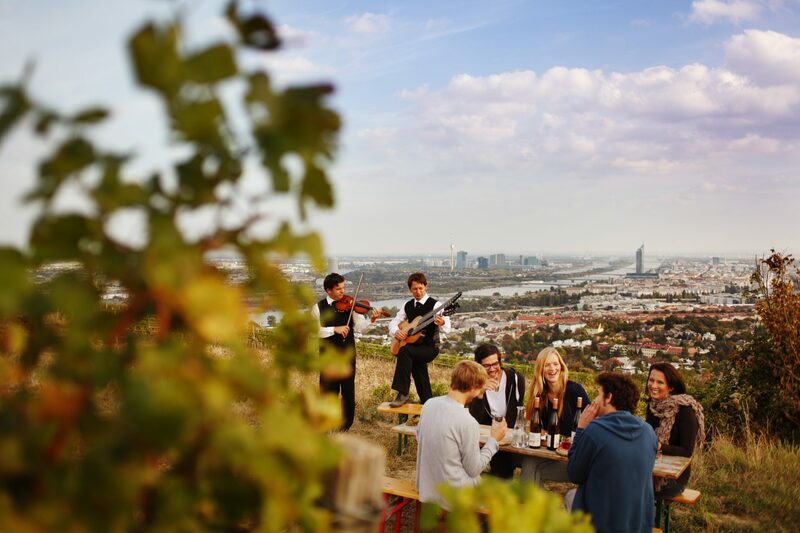 Wine, food and music are the mainstays of Vienna’s Heurigen culture. Emperor Franz-Joseph cherished the Heurigen in Grinzing so much that he protected the area, preserving its village flair to this day. By the end of the 19th century, Vienna was bursting at the seams. From the Congress of Vienna in 1814 to the outbreak of The Great War a century later, the population of Vienna grew sevenfold, as “migrants” from across the empire poured into the city in search of opportunity. Many were the Jewish, tradesmen and intellectuals from Galicia, Warsaw or Prague, a new industrialist class made possible by the opening of all professions in 1867. But even with new rights, Austria-Hungary was not a republic, but a sort of confederation without a constitution, whose parliament answered to the Emperor. Here, the coin of the realm was culture rather than ethnicity or military power. It was a society of manners and protocol, where art and theater, literature and feuilleton journalism were the stuff of life, whose importance was heightened by limited political rights combined with social tolerance. In the Kaffeehaus of fin-de-siècle Vienna, the richest life of the mind took place outside the university. It was a time, wrote essayist Clive James, when education was a life-long process, broader in many ways than any university, and more fun. One extraordinary group of intellectuals met at Café Griensteidl, on Michaelerplatz. They called themselves Jung Wien, gathered around writer Hermann Bahr. Among them was dramatist Hugo von Hofmannsthal, giant of the German-language Fin de siècle poetry and the Wiener Moderne. Another was the doctor-turned-novelist-and-playwright Arthur Schnitzler. Medicine had “sharpened my eye and enlightened my intellect,” Schnitzler wrote in 1920, equipping him for the diagnosis of society and human relationships. A pioneer of the technique of the inner monologue long before James Joyce’s Ulysses (1922), his novella Lieutenant Gustl (1900) was written the same year as Freud’s Interpretation of Dreams. Decades went by, most felt, before there was ever any meaningful public debate. Then in the 1980s, politics came roaring back to the stage with the playwright and provocateur Thomas Bernhard and Heldenplatz. Written in the wake of “The Waldheim Affair,” – new evidence showing that former UN Secretary General Kurt Waldheim had misrepresented his Nazi past – Bernhard’s angry theater captured a shift in the mood. A far better play is Jon Maras’ Old Wicked Songs, written the same year on the other side of the Atlantic, in the United States. This insightful and moving theatrical pas de deux is a far truer portrait of Vienna, where a young pianist and an aging master take on the Schumann song cycle, Dichterliebe (“A Poet’s Love”) and learn even more about what it means to be human. This is a work that joins the longing, heartache and denial of postwar Austria, with musical performance, artistic crisis, anti-Semitism, with young America versus venerable Vienna. And it is a tour de force. Not always flattering – the insistence on protocol, the petty stinginess of the professor, the latent anti-Semitism – yet the wit and trueness of the lines, the empathy and depth of character, make the portrait not only bearable but loveable. It is a thoroughly Viennese story. Yet it was not until 2008, a full 12 years after its New York and London premieres, that it was first performed in Austria, at Vienna’s English Theatre. And not again since. In October 2012, Vienna became a city of legends, as forums were filled with the faces and voices of some of Austria’s most distinguished émigrés. These were Jewish intellectuals of talent, drive and accomplishment, who had returned – often after decades of alienation – to form new bonds with a different Vienna from the one they left behind. It was a remarkable list: Nobel laureate Eric Kandel (then 82) on what happens to the human brain when looking at works of art. Ari Rath (then 89) longtime editor of The Jerusalem Post presenting his new memoir, Ari heißt Löwe: Erinnerungen (Ari Means Lion: Reminiscences). A fortnight later, legendary Hollywood producer Eric Pleskow (One Flew Over the Cuckoo’s Nest, Annie Hall) opened the 50th season of the Viennale Film Festival at the Gartenbau. 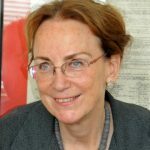 Then, Ruth Klüger (then 81) literature professor, author and social critic, spoke at the Volkstheater on the anniversary of the November Pogrom. And finally, pioneering chemist, novelist and playwright Carl Djerassi, (then 89) read for the opening of the Vienna International Book Fair. With the coming of Advent, the ball season begins, with over 450 balls in Vienna alone, and many more in cities and towns across the country. This is not, as you might imagine, an exclusive tradition. Balls in Vienna are for everyone, most put on by clubs and associations – the Red Cross, the police, the bakers, the coffee brewers – for anyone else who buys a ticket. So back under the gray winter skies, we accept melancholy as a part of life. People poke fun at the myth of the beautiful Blue Danube, saying it is never really blue. But the fact is, it all depends on the weather.